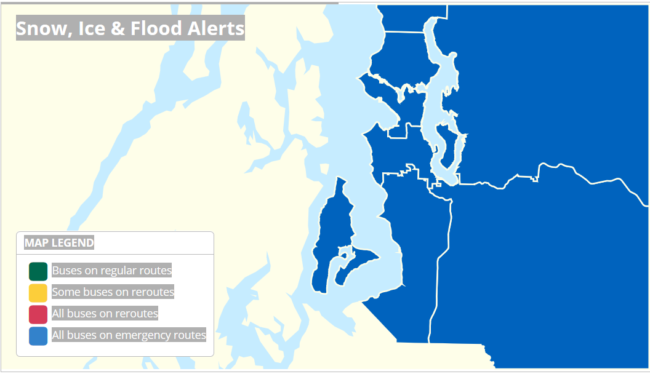 Have you ever seen Metro’s Snow, Ice, and Flood Alerts page turn blue? It did today. Update 2: STB now has a Snow Info Page, linked on the top bar, providing links to snow service pages for all transit agencies around Puget Sound and most around the state. Update 1: King County Metro has pushed out an announcement that it will continue on the Emergency Snow Network Sunday, and updated its website with the same information. However a 90% chance of snow is predicted for Sunday evening and Monday. In case you haven’t looked outside since early yesterday, it snowed yesterday, all afternoon, all evening, and all morning so far. The authorities heeded the meteological scientists’ warnings, and took drastic action. On Thursday, Governor Inslee delared a State of Emergency, limiting what vehicles are allowed to drive on state roads and highways, and begging people to stay home, lest they get frostbitten in the sub-freezing temperatures that will reach as low as 13 degrees Fahrenheit Sunday, and listed safety tips so nobody dies of carbon monoxide poisoning while staying home. King County Metro has taken a step into the blue-pill abyss, cancelling many snow routes and moving to its Emergency Snow Network. Only 48 Metro routes are running today, including two different versions of route 62, special route 90 connecting a circular swath of First Hill to 3rd Ave via Jackson St, a 252 shuttle, two versions of route 255, two versions of route 348, and two versions of the C Line. The County smartly waited until 4 am to go live with the network, in order to get people home safely last night. Even if your route is running today, and the map looks like your normal stops are being served, your normal stops might not be served, so check the Alerts for your route. Sound Transit‘s difficult-to-navigate new website and alerts page is somewhat less useful for figuring out where your route has been re-routed. I suggest checking out their most recent tweets. The latest tweet says their static snow re-routes page accurately describes the current ST Express bus routing. All that said, Link Light Rail has been running just fine. Indeed, it came to the rescue yesterday, running more frequently mid-day due to a ridership spike from people smartly going home early. Today, it is merely the only transit running on schedule. Most paratransit operations are only providing medically-necessary trips today. Amtrak trains between Portland and Seattle have been scaled back, at least through Sunday. Amtrak buses appear not to be running. Clallam Transit shows its closures on its front page. Community Transit has a well-curated list of snow re-routes, updated today. If your stop sign shows a snow flake, your bus is probably not going to serve that stop. Five Blue Swift Line stops are among the stop closures. Everett Transit has route 8 on its snow route version B.
Greys Harbor Transit shows its tweets on its front page. One route was shut down today. Intercity Transit‘s snow page list routes that have a snow re-route. Its most recent alerts don’t show any deviation from that plan. Island Transit has cancelled service today. Jefferson Transit shows its alerts on its front page. Kitsap Transit has an updated snow page listing which routes are on regular routes and which are on snow routes. Mason Transit cancelled morning service, thought it over, and then threw in the towel for the rest of the day. The monorail is shut down for the day. Pierce Transit provides the basic snow re-route info on its front page, and has good freshly-updated modified snow detour maps on each affected route’s page. Those going to SeaTac Airport should check flight status with their airline. I had no idea whether the Seattle Streetcars are running based on their static webpage. The absence of such routes on Metro’s ESN list suggested they are not. But commenters reports they are running! Skagit Transit conveniently lists its snow alerts on its front page. Spokane Transit is on regular routing today. Inconceivable. TriMet has its alterations, including vertical conveyance closures, neatly lined up on an easily-navigable alert page. Twin Transit (Lewis County) started late, but is operating for most of its service area. Vancouver Translink has a snow page too, with neat videos. SkyTrain actually gets more ridership in winter weather. Washington State Ferries is less impacted by the snow, but wants to remind drivers to approach cautiously. Check your specific route for any delays. Whatcom Transit asks you to check their tweets. They, too, use snowflakes on bus stop signs for stops that won’t be served on days like today. For the most up-to-date information, check out STB’s Snow Info Page, linked from the top bar, providing links to snow service information from each of the transit agencies in the Puget Sound region and most of the state. This is a snow-pen thread. Am I right in thinking that this is the first time that the ESN has been activated? I’m thankful that I don’t have to go anywhere today, but also that I live adjacent to four routes that are still running. First time since it’s inception. In 2008 there were similar reductions before the ESN was created. Thanks, that’s what I thought. This is definitely better-managed than the 2008 fiasco – I have a memory that the 44 couldn’t run west of Fremont for a day or two because the hill to Market was a sheet of ice. Yep, and I’m surprised it wasn’t really pointed out by Metro. In the 11 years since inception, the ESN has never been really evaluated, so it’ll be interesting to see how it goes and what changes might need to be made. I’ve never seen the ESN activated and I was surprised they’d do it now. But yesterday Metro canceled nineteen routes to scrounge up enough buses for higher-priority areas, so that’s probably why, The articulated trolleybuses aren’t going out in the snow so that’s a significant deficit to the fleet. Some of the routes have been tested the past few days. The 90 shuttle and 62 shuttle were running earlier this week according to Metro’s alerts. I believe 60ft trolley busses have less weight over the drive axles because a traction motor is lighter than a diesel engine. That would be my guess. They might be shuffling the buses around. Queen Anne is a bust, so cancel the routes, pull the single trolleys off of that, and redeploy them to Rainier Valley to get the articulated trolleys off the road—because they’re articulated, not because they’re trolleys. So, what does this mean for the day when Metro is fully electrified? Will they still have to keep diesel buses around, just for snow? If it’s an issue, that can be solved with ballast. I was just guessing this is part of the reason. If Metro is going to be 100% battery or electric, I hope they would have a solution for this. Maybe it could be a STB discussion. I mean, they were calling it a “once in a decade snowstorm” so I’m not surprised they’d trot out the ESN, if not now then at some point as the snow continues to fall. If not it would make me wonder why they have it at all. Am I right that our new articulated electrics are powered on the rear axle only? Because if so, might work as well as would a tractor-trailer truck with power on rear trailer duals only. When we first got the Bredas, some people saw chance that since center and rear axles were powered, both motors could’ve cooperated to keep the bus in line. Doubt it was ever tried. Sense I get is that Seattle gets snow so seldom, the system doesn’t consider the necessary mechanism worth the expense. Can anybody tell me if the Russians or their suppliers build an articulated trolleybus that can be handled in heavy snow? I think it was the 2008 snowstorm where the snow was down for a week like it had been in 1985 and somebody said 1996, and Seattle didn’t plow or salt the streets because plows seemed like a waste of money for every few years and salt kills the fish, and Metro just made do and ran the buses until they got stuck. (I lived at 56th & University Way and several times I saw 71/72/73Xs stuck a block north of there.) But in 2008 a lot of people had it and told the mayor where to go, and said Seattle had grown too big to just keep doing nothing except rain dances to hope the rain would come soon and wash away the snow. So the city bought more snowplows and made a list of bus streets it would plow and Metro published an emergency snow network. I never saw it used, and you may be remembering the other things from 2008 that weren’t actually the ESN in action. I was wondering this week, if they haven’t activated it now and they didn’t do so this week, would they ever? Only for an earthquake? Wasn’t the 2008 snowstorm that it go so bad for Metro with so many buses stuck all over the county that they cancelled all service on a Sunday to try to recover from the mess and use all of their personnel to bring the buses back to their bases. If I remember it was also the Sunday that a lot of carports and other roofs collapsed because of the weight of the snow and the fast melt because the temperatures warmed up so quickly. I don’t remember a day when all buses were cancelled. Maybe there was a day i didn’t notice. The year that Metro actually cancelled all service for a day was winter 1995/1996. The 2008 snow storm didn’t officially cancel all service, but service was extremely spotty for over a week. In ’96 I walked from 102nd and 15th Ne to the AVE. No busses came. Met my friend there, had a beer. Got on a 71, 72, or 73, don’t recall about an hour later, NB. The bus hit a car near 65th St. We all got kicked off. Then walked back. Oh, the memories. 1995 was my freshman year at the U and I was living in the dorms, so I didn’t leave the U-District very often and may not have noticed the bus cancellation. I think the snow started the day after Thanksgiving if I remember. I remember walking from my job near Seattle Center to the UW dorms on Eastlake that year in the snow. There was a guy with skis doing a faster commute. And in another snowstorm, 1990 I think, I was working on Meridian Avenue and and went to the Northgate transfer point (then inside the mall in front of the Bon Marche), and when the 66 didn’t come for an hour I walked back to my U-District apartment. Both of those trips took around an hour. Now that I think about it, 1990 was probably the worst. Busses lined up from East John to the top of the 23rd ave hill facing north. Walked from John to 46th and Phinney. Never actually made it home. Wait a minute. The first snow with Eastlake was 1985. not 1995. The second one with Roosevelt was 1990. The 1995 snow I can’t remember anything specific, but that must have been one of the times when I saw multiple 71/72/73Xs stranded at 56th & University Way. If my memory serves me right, I believe buses were still running in the aftermath of the post holiday 1996 storm. I was living in Wallingford then and working down in Georgetown. I remember eventually getting on a crush-loaded bus to get downtown and then transferring to a 4th Ave bus that got me to around Costco and then trudging through a foot of snow to get to my office. I think it was the 1990 storm that ground Metro buses to a halt. I lived in the CD in Seattle then and worked in downtown Bellevue and distinctly remember having to spend the night with several coworkers camped out in our offices in the old Koll Center. The 520 bridge had essentially become a parking lot as vehicles got stuck or simply ran out of gas and people from both passenger and transit vehicles ended up walking off the bridge in their attempts to get home. I think it took a couple of days for the state to clear all of the abandoned vehicles. KH, was that not December 1996? Walsh closed the whole system for a Sunday. I walked to Ballard from Roosevelt. Yesterday I saw routes like the 43 and 49 running, what was that all about? The 49 is a very high ridership route. I would hope it would be one of the last routes canceled if Metro had to cancel more routes than the ESN requires. Metro did cancel many runs of the 43 yesterday, but I believe it uses the 43 as the 44 comes in and out of service. You might have seen one of those. Metro has positioned the 49 as the main Capitol Hill route, with the highest frequency and night owl. But even the 49 stops running in the ESN. Only the 3 and 10 serves Capitol Hill and First Hill the normal way (with the 3 rerouted to Jackson-12th-Boren-Broadway it looks like). The rest is covered by the 90 shuttle, which winds and backtracks more than any Metro route has probably ever done. For those who remember the 84 night owl (the Madison-23rd-Jefferson triangle) it’s reminiscent of that but worse. Its map is an artistic sight to behold. I assumed that the 49 would be running in the ESN but I guess not. I guess that hill on Harvard/10th is a bit of an obstacle in the snow and ice. At least the streetcar is able to provide service on Broadway! I can confirm that the SLU Streetcar *is* running. I had a pleasant ride on it this morning. I’m not sure what nonsense they might be doing to keep the rails from freezing, but my general impression is that the streetcar is safer and more reliable than the buses in these conditions. They keep the tracks clear (doesn’t matter if they are “frozen”) by running the trains, snow plows and dropping sand for traction. It can matter very much if switch points are frozen, and I doubt the streetcar has switch heaters. Of course the streetcar, by its very nature, avoids steep hills. That is most of the battle in this city. The 7 (a line that is also very flat) is unchanged except for the tail being cut off (no service to Prentice). Walked through SLU this morning, and can confirm that I saw the streetcar running, although I didn’t ride it. Don’t know anything about the status of the First Hill streetcar, though. I saw the First Hill streetcar running today. As for whether the streetcar is running, I poked around on SDOT’s camera feeds and found evidence that the streetcar is running at Broadway & Pike. No idea what the delays are like, but with very little traffic, maybe this is the time for it to shine! Sam was busy advising the governor on the emergency logistics but he sent this: how do you know that camera feed isn’t fake? They may be playing a tape from last week or airbrushed the streetcar into the picture to make SDOT look good. Lol. You made my (snow) day with that comment. I was surprised to see a 252 shuttle running on a Saturday, given that the 252 proper is a weekday only Seattle express route. If you look closer, you can see why. The 252 that’s running isn’t the whole route, just a shuttle connecting Totem Lake to Brickyard P&R, covering service that would normally be part of route 255. Basically, it appears they split the 255 into three parts. One from downtown to South Kirkland P&R (branded as rout 255 snow route). One from South Kirkland P&R to Totem Lake (branded as route 255 snow shuttle). One one from Totem Lake to Brickyard (branded as route 252 snow shuttle). So, no, Kingsgate is not getting any special service they would not ordinarily be getting on a Saturday. Yeah, I knew it was just a shuttle, but I assumed it was weekday only (like the 102 snow shuttle). If the 255 map is correct, it looks like the 255 has two shuttles, a S. Kirkland shuttle and a Brickyard shuttle. And with the 252 shuttles, it seems like the Totem Lake – Brickyard area is double served. The 102 is normally peak only. If it’s really running today as a shuttle, it must be compensating for the 148 and 906. Maybe it has flatter streets than those routes. There are three routes running the 255: the main route 255 will go from Seattle to Totem Lake, but via lake Washington Blvd snow routing. The 255 shuttle will run in south Kirkland including serving the park and ride. Then the 252/255 shuttle runs north of Totem Lake. It’s just one combined shuttle but called 252 so there aren’t two 255 shuttles. So even though it’s 252 it operates full-time. The 102 shuttle is weekday only. Thanks. That webpage has a lot of counterintuitiveness to its navigation. But the latest tweet just sent out confirms that page accurately describes the current path alterations. Looking up schedules is kinda newfangled as well, not that those will help today. As usual with snow routing, OneBusAway has no idea what is going. It’s still showing the buses as if they were traveling the regular route, rather than the snow route. And it’s still showing scheduled arrival times for routes that aren’t running today. At least the real-time info is mostly working for the routes that are running. You think after all these years, they would have found a way to get OneBusAway to automatically adjust its route maps. I find it much easier to figure out where to catch the bus using an interactive map on my phone, with bus stop locations clearly listed, rather than a PDF with static images, which only labels some of the streets, and combines multiple routes together on one image, making it unclear which route does what. PDFs should be excluded from public services information provision. The problem is not so much the PDF itself, though an interactive map would be ideal, but how cluttered the PDFs they have are. I looked at the route 90 link and it was incredibly difficult to make out amidst the maze of other routes. Since it just looks like the Metro system map I imagine figuring out what routes operating in multiple parts do is worse if you’re not actually looking at the part. I’d prefer something more like Metro’s normal timetable route map, or maybe something like the maps made by Community/Pierce Transit with the street grid and other routes overlaid in lighter print, if you’re going to go the static PDF route. I think the idea is to give you an overview map, and then you are supposed to look at the specific route for the details. The 90 is an ESN only route, which is why the map for it is on a different page. I’m not saying it is great (it isn’t) but it is no different than how they present any of their routes. Or for that matter, how most agencies present their routes. The Metro system map *is* interactive (http://kingcounty.maps.arcgis.com/apps/webappviewer/index.html?id=3e239c9048604de8a1c73b72679bc82e) which I find much easier to use than a PDF, but if you zoom in, it doesn’t present any more detail. It is simply easier to read (the letters get bigger). I can’t see bus stops, nor are minor streets suddenly in view (the way that, say, a Google map presents itself). I think most people would prefer something akin to a Google Map. Interestingly enough, Sound Transit does provide something very similar (except with Bing as their base map). The problem is, they don’t have a system map. It is only for individual bus maps. (It also helps that they only have a handful of stops on each route). I suppose a system map for Sound Transit would be kind of strange, given they aren’t really trying to cover an area (like any of the other agencies around here) but as a transit fan, I would still like it (especially if it was presented the same way as their individual bus map). I’m sure a big issue is that agencies like Metro are still focused on print. They still provide paper schedules, and I’m sure lots of people still use them. Thus if they made the transition to a completely electronic format, they would have to do twice as much work when things change. That being said, it would be a heck of a lot more dynamic. You would have your normal (fair weather) system map, and your inclement weather map. If things get even worse (and buses simply aren’t running in one part of town) you drop it from the map. Same goes for the individual bus maps. It would all run on an app that would center on your location (like a Google Map) which means that you could walk to a bus stop, go to the map, and figure out your best option. All of that requires a sophistication that most bus agencies aren’t prepared to fund. Well, the schedule brochures and PDFs seem to come from the same source, and Metro must have the GIS geometries for its own internal planning and coordination, as the city planners have for their work. The brochure maps may even be generated from that. I suspect the problem is Metro struggling to come up with the clearest map format. Maybe Oran to the rescue? That and Metro’s inability to even get a real-time data feed that’s accurate and can comprehend reroutes and minor holidays, much less to instruct it to “Change starting with this run in 15 minutes”. Having a dynamic map like you describe would require a data feed at least as sophisticated as what OBA uses, and Metro doesn’t seem to be able to do that. My guess is basically everything is made by hand, from scratch. At most they start with some sort of street map and then draw the route lines on it when making the system maps. My guess is Oran is in the same boat (I’m curious — maybe he will comment). But Oran’s maps operate the same way as the other system maps, and every system map that I can remember ever seeing. Zooming in does not get you more detail — It simply makes it easier to read. I think it is highly likely that Metro’s individual schedules are drawn by hand. To be clear, I’m not literally talking about pen and paper, but rather, connecting arbitrary points, like you would do in Microsoft Paint. The new schedules look remarkably like the ones that have existed for years and years, which is why I think there is no sophisticated GIS software system driving it. The online versions are basically the same as the print versions as well. On the other hand, Sound Transit draws their schedules over Bing Maps. My guess is they are doing that in the same way that I make “Google My Maps”. They are just drawing them over the map. It is possible, though, that there is more sophistication involved. Maybe they just enter the coordinates of each bus stop, and then have some software that draws it for them. I assume that Microsoft has an easy to use API, which means it doesn’t take that much work to provide that. For that matter, Microsoft may have done it for free (as a promotion for Bing Maps). Either way, though, I don’t think it would be that difficult for Metro to make the transition. I assume that Metro has the coordinates of each bus stop, which is the key piece. It doesn’t sound like a huge project, but it would still be a project. At that point you are providing two different formats (the old one and the new). You could abandon the old one, but that means that when printed out they aren’t as nice. Sound Transit does have a system map. It is in the bottom of their website under Quick Links and is the same as the one inside the schedule book. They have a slightly different version they post at stations that includes non-ST services like BRT and the streetcars. Metro’s route timetable maps have been the same style since the 1980s and to me, look manually drawn in graphics software, traced over a street map. To keep costs down, the timetables are printed using only 2 colors, black and whatever color they choose for the shake up. That’s not to say they can’t get creative and design a better map but inertia rules. A few years ago we worked on bus route maps for Honolulu and they too, use only two colors. ST a few years ago switched to schematic mapping for their route maps in the schedule book. Because their routes run long distances with few stops in between, that’s a good way to present their service on a small page without tons of wasted space and tiny text. It still annoys me that Metro can’t/won’t produce maps for their reroutes. Instead they give you turn-by-turn directions which as a spatial navigator I find not as clear. Meanwhile, SF Muni has been putting up reroute maps at stops in their new system map style. It would be a fun civic hackathon project to produce a system that lets you input a text description of a reroute to produce a map for print and data feeds. It is even less excusable for the snow routes since they are pre-determined. As for the prediction function, it is less useful than you think. When adverse weather is involved, any notion of a schedule is thrown out the window. In this case it is more useful to indicate the location of a bus, like how many stops/miles away it is, than to give an ETA. The version of OneBusAway developed for NYC has this function. Ross have you played around much with this? It’s not particularly easy to use on a small screen but it sorta gets you an interactive map. Metro’s maps look much like those in a number of transit agencies, so it might be there is a publishing house that specializes in making these. Glenn, I work for a “publishing house” that specializes in transit information design for a number of agencies across the US. KC Metro makes theirs’ in house. @Glenn — That is great, and exactly the type of thing I’m talking about. It is the only one I know of (although I would bet there are more out there). One of the key elements is that different things are exposed as you zoom in. Not only with the base map (OpenStreetMap), but with the added transit layers. The bus stops don’t appear until you zoom in. This is great, as it means that when you zoom out, it isn’t cluttered with a lot of dots everywhere. For example, this map I made has a lot of station symbols, and when you zoom out, it is messy (https://drive.google.com/open?id=19pwUFBe-I8-LeP6jdbhj-IM_nfcQdrNH&usp=sharing). Likewise with ST’s schedule maps. They look great when you zoom in a bit, but if you zoom out, it gets really cluttered. As Oran mentioned, they are OK in general because there aren’t that many stops (just as my map works for the same reason). If you had big symbols (that didn’t disappear or shrink) for each bus stop in Metro’s system, it would be a huge mess. I really like the TriMet map, and it makes me wonder if other agencies could leverage that work (or if TriMet simply leveraged someone else’s). OpenStreetMap is open source, and I assume someone just wrote a program to draw the lines using the existing bus stop and route data. It seems like this could be exported to various agencies and then it is simply a matter of converting formats. Thanks for letting me know about the ST system map, Oran. They also don’t have an interactive system map. Their map is interesting, focusing on bus stops, which (as you mentioned) works quite well because there is a long distance between them (in general). Hey Oran, if you don’t me asking, how do you make your maps? Do you have a base map (with streets, schools, etc.) or do you everything from scratch? I’d be curious to hear why people are taking transit today. If you’re going to report in and say you rode the streetcar or a bus, tell us what your trip was about. And tell us what’s open out there, if you see any businesses or restaurants in operation. Or tell us of a business that you were surprised that was closed. STB is open for business. You’re welcome. I don’t have to work today, but many of my colleagues do. Hospitals, clinics etc. stay open. Nurses (and other health care workers) don’t get snow days. Additionally, my hospital has hardly any parking for those that choose to drive in. They encourage us to take the bus, which is great normally, but not so much right now. I didn’t take transit today; does that count? I walked to Cal Anderson Park and in the ballfield there were fifty people in the ballfield. ten dogs, seven snowmen, a snow bear, a DJ playing urban dance music, and a Seahawks tent. You live in capitol hill—one of the most walkable neighborhoods in the city. Easier to walk to places of culture, groceries and dining. Yes, that’s why I live there, where the largest number of bus routes meet and it’s close to downtown where all the other routes are and there are several choices for supermarkets etc. I wanted to live on Capitol Hill for twenty years and fortunately now I’m able to. I wish there were more large urban villages like this and the U-District. My mom lives in an apartment in the suburbs in a residential-only area, and the only thing a few blocks away is a mini-mart and a pho shop and that’s down a hill, although fortunately it’s on the B. So I feel for people who live in places like that and don’t even have a route like the B to get anywhere in the snow. I wish all the cities would retrofit those areas with mixed-use so they’re not so isolated. Looking at the ESN map, it seems like they should really have an entirely different set of routes that operate, to reduce confusion and to free planners from trying to approximate the current service patterns. One thing that should change about the ESN is that Metro should be extremely aggressive about truncating to Link. I would think that Link is extremely under-utilized in the snow due to lack of demand, and can run very close to schedule with little disruption. Capitol Hill in particular should have many routes that run to CHS. The current ESN seems very reminiscent of the pre-U-Link days, with big service holes (49, 11, 2/12, etc) and an attempt to fill those holes with a zig-zagging 90 that misses CHS by half a mile, but goes downtown… very slowly. Rainier Valley should have nearly every route truncated at a Link station, like the 106. They could then they could enable the 50 east of MLK, connecting riders to two Link stations. Routes 150 and 101 should also be fully truncated to Rainier Beach Station. This can preserve frequency on connecting routes, and would probably actually save time for riders even with the transfer penalty. I agree, and it would be a good way to demonstrate how truncating at Link helps folks even under normal weather conditions. “The current ESN seems very reminiscent of the pre-U-Link days” probably partly because it was created in 2008 and might not have been used or modified since then. Lots of routes have been modified, so the plan must surely have been modified. the 10 is on its new route, the 62 exists, etc. The 90’s purpose is to compensate for the canceled routes between downtown, the First Hill hospitals, and the Central District, for those who don’t live close enough to the 3 or 10. The zigzagging is due to where the flattest streets are and the must-serve hospitals are. There’s a general transit hole in the axis from the Summit area to Swedish and Swedoish Cherry Hill, and from the latter to Capitol Hill Station, but a snew emergency is not the time to try a new network idea to the station. I get that, but that argument is basically saying that the #90 routing is frozen in time, and can never change. There are definitely gaps without it, but there are ways to fill them without such a circuitous route, especially a one-way loop. For instance, how about a route that just took Pine St. from 1st Ave. to Boren, then Boren to the First Hill hospitals, looping around at Harborview, and running both directions. Then, add Madison BRT (RapidRide G) to the ESN. That’s why I was surprised that the 49 was gone rather than truncated or something. The 47 used to be rerouted to Pine-Broadway on snow days, so you’d think the 49 would be able to do that. But that’s something we can ask Metro after the snow is gone: how well the 90 is performing, how many people are using it, and whether Metro has thought about reconsidering its routing. RapidRide G will trigger another round of restructures, and it may become another ESN route, because all the other RapidRides are. Although none of them are steep hills like that. Except, is the D really going up and down West Mercer Place? Obviously the circuitous route is due to special circumstances, and it’s meant to get people where they need to go eventually, but not fast. Just modifying the Pine street portion to do a circle around CHS (maybe through the small one-way Denny way) would be fine. It’s hard to imagine why they can’t have a short 49 that just goes to CHS. It’s gotta be due to lack of resources. Maybe they could pay for it by removing the 41. I’d remove the 41 and truncate the 10 at CHS, then add the 67 and the truncated 49. That’s one of the things to interview Metro about, why not a short 49? It’s probably because they needed the 10 more for coverage on 15th at the top of the hill, and they needed the 90 for all those other areas, so the 49 was third priority and didn’t make the threshold. Also, the 49 is going away in the 2025 plan. It’s only hanging on becauase I-District Station isn’t open yet. The plan is for a north-south route on Broadway, and a 2 on Pine-12th-Union. And if the 49 can’t connect to the U-District anyway in the snow, then that dashes a lot of its purpose. The 41 should continue to be part of ESN because it is the main route from downtown to NE Seattle and the Northgate Transit Center and allows passengers to transfer to the 75 to go to Lake City since the 41 does not go further then the transit center on its snow route. Passengers can also transfer to other routes at the transit center to get to their destinations in north Seattle. The 41 is the trunk route to all of far north Seattle, and it has a P&R so people can drive to it. Without the 41 the E is the only trunk route to far north Seattle I think, so they may think it’s not enough. If Link were to go to Northgate and Shoreline yet it would be another issue. If the G were going to be on the ESN with anything resembling its actual route the 11 would be now. At the very least it would need to take Jackson or Pine to Broadway like the other Capitol Hill routes. Well, I don’t know. Metro hasn’t said it would run the G, although I doubt it given that it has cancelled the routes on similar hills, and the fact that the G’s entire route is hills. The 11 seems to be gone because the 3 and 10 were considered higher priorities and the 11 is near them. And with Metro bolstering a 2-Pine-Union route maybe that’s what it would favor. I suspect Metro might think for a second about running the G because it’s RapidRide and then look at the hill and say “Nah”. The same would happen with the 120. Hmm, what is happening in West Seattle now? It looks like the C and 21 are running. And the 21 has a big hill in the middle. Thank gawd Light Rail and Seattle Streetcar are both running as designed and basically unaffected. It is nice to know that at least something out there is reliable and can be counted on. Metro has really dropped the ball on getting real time, easy to understand information out to their ridership on which routes are cancelled, which are on snow routes, and which have service revisions. There is a lot of frustration out there about the lack of accurate info that can be used to make commuting decisions. The ESN is easy to understand. Any route not listed is cancelled. Except a lot of DART routes ran. None were designated as ESN routes. 906 ran even though it quits when they call for snow routes let alone ESN. I had no trouble finding Metro’s ESN page, or understanding how to use it. Sound Transit’s new website feels like it was designed by someone who has never surfed a transit agency website before. If feels more like it is trying to sell something than help people navigate a transportation network. The table of contents is totally non-intuitive. You have to keep guessing until you find the route schedule link. And then, they have some sort of RTA thing instead of schedules. So, I’ll have to just depend on the printed book. Yes, ST’s site has a snow routes page, if you can find it. But the page doesn’t say which snow routes are in effect. There is no central page that lists the current status of all routes. You just have to search through tweets (not on the site), or alerts. Most of Metro’s customer base has never heard of the ESN, and no customer should be forced to go looking for info on their bus route just in case Metro changed it. The info should be pushed, it should’t Be a pull system. And the problems with Metro’s outreach actually started before Metro activated the ESN. This is. It an ESN vs non-ESN problem. It is much more widespread than that. I totally agree. I think the site as a whole is terrible, particularly the project and board document archive. I don’t need these giant pdf icon listings which require one to keep hitting “show more” or “next page” to find the desired document. (The old format of all the relevant documents, grouped by time period in many cases, all shown as pdf hyperlinks on one page worked just fine.) It was way easier to find documents on the old site. This new site just seems like a lot of graphic fluff. I’m guessing there are other routes that are basically unaffected. The trains are largely unaffected because they can’t go up steep hills. Routes that don’t go up hills (routes like the 7, 70, 40) have only minor changes. But routes like the 2 and 13 can’t go up Queen Anne Avenue because they don’t run the counterbalance anymore. Agreed that Metro’s outreach doesn’t reach most people. It’s a difficult issue because Metro can’t phone everyboty to tell them what their route is doing right now, and it can’t go put up signs at every bus stop. It doesn’t even know when a snow route will end until the last minute, and passengers can’t tell the difference because the streetscape looks the same before and after. Expecting everybody to have a smartphone and look at Metro’s website is unrealistic. And if it could fix OBA’s data feed so easily, it would have done so by now, because Metro needs that information too. As we know, the data is noisy for some reason, and OBA does interpolation to guess what the real situation is, and other bus-info sites do their own interpolation. With that uncertainty I wouldn’t it expect it to be able to handle snow routes, and even if it did I would question whether it was accurate and had the last-minute changes. Metro should mail a postcard to everybody on First Hill/Capitol Hill with the ESN (and a clearer route 90 map), and put a brochure in the usual places where bus schedules are. Anyone have a link to these supposed driving restrictions that Inslee supposedly put in place? This is the first I’ve heard of them. We have an event tonight that has not been cancelled, and we were planning to drive. This is the most likely suspect I could find. It seems to be more about road reconstruction than about banning SOVs during rush hour so that buses can jump the queue. All I saw was an exemption of some rules limiting the number of working hours for truck drivers, for those carrying essential supplies like food. The idea being to keep the grocery stores well stocked during the snow event, and not having people go hungry so that the drivers can rest. Is route 67 running? It is not listed in the ESN table which would imply no it’s not. But the 65 is running and is usually through-routed with the 67. Also, both OBA and Metro’s trip planner are showing the 67 running. The map shows route 65 isn’t through-routed today, so no 67. Routes 73 is also not running. At least there is route 45. But not running route 67 leaves a dense apartment corridor out. Maybe that’s why the route wasn’t a priority. The 67 goes up Maple Leaf via Roosevelt. This is both steep and generally an area with more snow (a little higher elevation and a little farther from the water). What is weird is that the 41 stops pretty much at Northgate TC. You can take the 75 and 348 though. This means that the apartments close to Northgate still have connections to Lake City and can connect to the 41. The other densely populated part of the 67 (the area south of 65th on Roosevelt) is covered with the 45 and 62. So basically it is just Maple Leaf that is left out (again, because it is hilly and typically very snowy). It is really Queen Anne where lots of people lose out. It too has a big hill, but unlike Maple Leaf, a lot of apartments as well. The 3 serves upper Queen Anne, and is within walking distance of the whole village which is pretty flat on top. It’s the Queen Anne Avenue hillside south of Galer that’s out of luck, because it’s steep southward to Uptown, and steep eastward to the 3. But there’s not much Metro can do about that if it can’t run a bus on the Counterbalance. There was an anecdote several years ago about a new school principal or superintentent from back east who refised to close the schools during snow, saying, “Snow schmow, these wimps need to learn to deal with a little snow.” He drove is car down the top of Queen Anne Avenue, slid down the hill, and then agreed to close the schools. By the way, what makes our snow different from back east is that the temperature stays near the freezing point, so the snow thaws and refreezes as ice, then another layer of snow comes on top of it building unstable slippery layers. If it were colder it would remain as nice compact snow. So be careful everyone. I went into work Wednesday and successfully negotiated all the snowy sidewalks, and just outside by building I was walking across a grassy field thinking about something else, and slipped on a small unobtrusive patch of ice. It wasn’t bad but now I watch the sidewalk ahead every step and try not to think of other things. Remember when all the gadgetbahners down at the Elevated Transit Company/Seattle Monorail Project told us we should build monorail instead of more Light Rail? Supposedly monorail had better reliability and grade climbing capability because rubber tires on concrete have more traction than steel on steel, etc etc etc. Well today the 1-mile monorail system is shutdown while the 22-mile LR system and the SC systems are the only modes that are operating basically unaffected. I think it has more to do with lack of interest in running the service on a snow day when they don’t expect ridership, and its limited utility, than with the technology. That said, there is nobody manufacturing the vehicles that would be needed to improve headway on the line, so its useful life runs out when the useful life of the 2-vehicle fleet runs out. Part of the politics of the longer monorail was to contrast it to the more expensive light rail. Licata and others used the monorail as a way to try to defund ST. But plenty who supported the monorail wanted it to complement light rail, and they were the ones who did the heavier political lifting. Unfortunately, those using the monorail as a tool to stop light rail got a restriction on the funding mechanism that it cannot be used to fund light rail. Now that Councilmember Herbold is pushing to fund burying the West Seattle line, she must be regretting her role in making sure the monorail funding could not be transferred to light rail construction. Karma, I suppose. If the Seattle Center Monorail were running today, and accepted ORCA, I think it would get high ridership, just like Link and the SkyTrain, with people riding because they can, or to spend time at the Seattle Center. Sans, ORCAzation, potential frequent riders will continue to ignore it as an upcharge tourist trap. Every day, all day. Supposedly the city is (hopefully) working on getting the Monorail ORCA compliant for its eventual use of transporting NHL fans to the Seattle Center Arena for the 2021 season. For without promised ORCA compliance, the Monorail would continue to be the outdated fossilised piece of shite that its been for many years. The lines of fans trying to make the 7pm faceoff would extend into the ground floor of Westlake Mall due to waiting for ticket booth holder to make change for tickets to get on board. The monorail now accepts debit/credit cards. Seattle owns the plans for the monorail, so it could commission more vehicles if it wanted to. It has already run fifty-five years, which is longer than Metro’s bus fleet, and I haven’t heard that they think it will become irrepairable any time soon. Cuba still has 1950s automobiles that they keep fixing up. If we had a monorail system using SAFEGE-style enclosed suspended rail, it wouldn’t have issues running in snow and ice. Chiba, Japan has a 15.2 km network built by Mitsubishi starting in the 1980s. The existing monorail is only slightly shorter than the South Lake Union Streetcar, but somehow the Streetcar is considered critical enough transportation that it is kept running, but the monorail is not? Doesn’t make sense. And if it really is nothing more than an upcharged tourist trap, then all the more reason to keep it up and running. Tourists don’t go away just because they get surprised by bad weather, and tourists are less likely to take a different mode. Through an email Metro Transit has announced that ESN will operate on Sunday, February 10th and possible beyond. Apparently the city/county will make a decision on whether to maintain the ESN at 10 each day. Given that the NWS has just issued a winter storm watch from Sunday until Tuesday, it’ll be interesting to see how long we stay on the ESN. UW also just announced that it would suspend operation tomorrow, and I don’t know that they could justify opening completely on Monday while the ESN is in effect. My porch got 2 inches this week and 4 more inches since yesterday, so even the minimum 5 inches would be more than either of those episodes. I also can’t remember when it has snowed repeatedly over several days. Usually it snows once. The BBC Science had an article about this about a year or two ago. There used to be a set of powerful winds circling the poles that kept the coldest temperatures at the poles. Global warming has broken down this wind pattern. Consequently, places like Nuuk, Greenland are having temperatures 30 degrees above normal and naturally the cold air goes elsewhere. TriMet has finally decided to experiment with electric ice melting heaters on sections of the MAX overhead lines. King County Metro and SoundTransit might want to look at them too, if they aren’t already. Though, they might not perceive a need since Seattle doesn’t get quite so many ice storms like we do, originating in the Columbia Gorge. ST has done something to the tracks some times in past snows to keep them clear, something like warming or something. And it’s talked about running trains all night this time to limit the coldness. Probably switch point heaters to keep the switches from freezing into position. They make those in propane, diesel and electric. TriMet has done the run trains all night to keep the wires clear thing too, but a few recent ice storms have been too severe, even after they installed ice breaker pantographs. Can a public transit outing on a snow day be stupid? I ask this because yesterday on on tv a local news crew that was out in the burbs somewhere asked a lady who was stuck in traffic why she was out in her car in such inclement weather. Her reply was that she was craving a latte. So if an discretionary outing in a personal vehicle can be arguably moronic, I have to ask the comment section, can a trip on public transit in this kind of weather be equally moronic? We can evaluate other people’s trips but there’s not a lot of point. Some people have essential jobs, others have minimum-wage jobs where they’ll get fired if they don’t show up, others need to get groceries or prescriptions, others have to visit elderly relatives to make sure they’re OK and comfort them, etc. If you’re cooped up in a house for several days you may really want just one outside meal. I wouldn’t get a latte but then I don’t drink coffee. And it’s relatively reliable to take Link somewhere if your origin and destination are near it, so why not? It would have to get significantly worse before that would be a foolish option. Today I saw an SUV turn and slip a bit in the snow, and I thought, “Are they doing an essential trip or a trivial trip?” But of course I’ll never know. Your assignment, if you accept it, is to test the hypothesis. You aren’t done until you’ve tested all possible dangerous transit trips. Only if its taking a spot on a full bus from someone with a critical trip. That bus is still running. Obviously, the definition of a critical trip is being left vague and up to the individual to determine. But yeah its also fair to say getting a latte isnt especially when clogging up the street and creating a hazard with a car. With all of the comments about Metro and Sound Transit and their snow operations and what they are doing right or doing wrong lets give a big thanks to the drivers and all of the people who are doing the very difficult job of keeping the service going under these weather conditions. They are working long hours and need to be acknowledged for the job they are doing. Absolutely. +1. I wave and give them a thumbs-up when I see them (which in downtown/Belltown is still frequently). At 6:30pm, 75 and 41 still running reliably but slow on their snow routes. Check 62550 for text alerts on canceled runs. So much for assessing the situation at 10 am each day… Metro has already announced ESN for Tuesday. What an agile organization. The system essentially does not exist right now if you are not using Link..
Yeah its not going to be good but I think you are underestimating how complex running a huge bus system is over such a large area in such well-forecasted poor conditions. It also requires staff to come to the base and run the buses. There will also no doubt be many incidents involving buses, its almost a given. I understand the frustration with the early announcement for Metro’s plan for Tuesday but they are also working under some very difficult road and weather conditions and trying to do the best they can. Maybe one reason for the early announcement is that drivers are having problems getting to their base and they are having problems having enough operators to drive what is needed on ESN on Monday and they have the feeling that the same situation could occur on Tuesday. Making the decision at 10am contradicts Metro’s website which says once the ESN is activated it will remain so for the rest of the day. The only way to reconcile the two is if the 10am decision is for the following day. Also, “Puget Sound Trip Planner and third-party apps will not reflect ESN service and will not be accurate for planning itineraries on ESN days. ” The regular alerts list also seems to be not updated since before the ESN. I can’t imagine the ESN 90 will handle the demand well. That’s a lot of coverage area with largely one single confusing counterintuitive route. Surprised there aren’t several snow shuttle routes utilizing either Pike-Pine or Jackson. Around 11:30am on Pine at Broadway I saw an eastbound 10 (which is supposedly on John), and a bus without a number in back that turned right (to go south on Broadway). I was too far behind to see the front sign. It might possibly have been the 90, or a bus going to the base. Metro has already announced the ESN will continue through Tuesday. But the latest forecast says the snow will change to cold rain tonight for most places south of Everett. If that rain melts the current snow, any chance Metro returns to a more regular service Tuesday? I’m sure schools and businesses would want to open Tuesday if conditions improve, but the ESN would hinder that. I can see demand overload for Tuesday especially if the snow melts substantially. People will want/need to get out, but there won’t be any extra peak capacity. I’d consider working from home again just because of the bus situation. Friday afternoon trying to leave downtown was not good. Too many people trying to cram on to the non-rush hour buses. ESN has even less capacity.